"This is a nice holiday cocktail. We always serve this at our Christmas Eve open house. It has such a nice taste!!" Pour champagne into a champagne flute, and top with cranberry juice. This recipe is even better if you add 1/2 oz of Cointreau or Triple Sec to kick it up a notch. This cocktail is really delicious and festive. 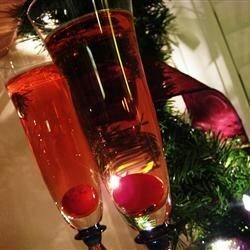 I prepare by first adding about 1/4 cup of cranberry juice then add the champagne and top with a few cranberries.? Great cocktail! To make it look pretty, drop a single cranberry into the champange flute before pouring in the champagne and cranberry juice. Adds some color and looks beautiful. I love this recipe, I call it cran-pagne, I top it of with a few frozen cranberries, and I small bundle of fresh mint for that real holiday look. I made these for New Year's Eve and they are very good! I added a splash of triple sec too. A maraschino cherry topped off the drink.